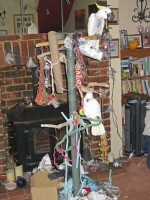 Keeping birds in our home environment presents us with many challenges. Ensuring the safety and well-being of our feathered friends is a large responsibility and one that is taken seriously by many of those that enjoy keeping birds as pets. Keep in mind that our homes are not a natural environment for birds and in many ways can be very hostile to them. 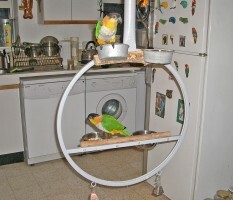 To keep them from harm one should always monitor their birds when they are out of their cages. The following excerpts are from The Complete Bird Owner's Handbook, Gary A. Gallerstein D.V.M., Howell Book House, 1994. This excellent book covers all aspects of bird care and health that is essential for both the pet bird owner and avian professional. We wish to thank the author for the permission to present this material to you. Net Pets hopes that you will find Dr. Gallerstein's information as an exceptional reference source in helping to provide a safe environment for your birds. Contact with a known poisonous substance, including chewing or playing with the packaging, exposure to fumes or odours. Opened or spilled containers of any poisonous substance. Toxic plants recently chewed on. For Sudden onset of regurgitation, diarrhoea, coughing, breathing problems, and/or depression. 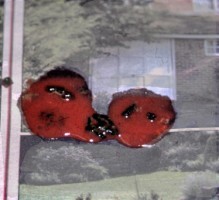 Bloody droppings, Redness or burns around the mouth. 1. Remove the poison to prevent further ingestion. 2. For eye contact, flush the eye with lukewarm water. For skin contact, flush the area with water. For fume intoxication, ventilate the room immediately - open windows, use a fan, or better yet, remove the bird from the area altogether. Bring a sample of the poison and its packaging. Bring a sample of the bird's most recent droppings. Lead poisoning is one of the most common toxicities occurring in pet birds. There are a number of potential sources of lead in most homes. This type of poisoning could frequently be prevented by simply recognizing the common sources of lead in the environment. Bird toys weighted with lead, old costume jewelry, lead caulking in stained-glass windows, fishing weights, curtain weights, and some types of screens and wires cause the majority of lead poisoning in pet birds. Newsprint, lead pencils, and paint manufactured within the last twenty years will not cause poisoning. As strange as it may seem, inspect branches to be used as perches before placing them in the cage. There have been cases of birds finding and ingesting buckshot embedded in the wood. Seizures, "walking in circles," "head wandering". General signs of a sick bird. Unfortunately, there is no first aid available. In most instances, the pet owner is not even aware the bird has ingested lead. Treatment is very specific, and veterinary care must be initiated as soon as possible. "Teflon Toxicity" or Polymer Fume Fever. Polytetrafluoroethylene (PTFE) is a synthetic polymer used as a non-stick surface in cookware. The brand names Teflon, Silverstone, and T-Fal are the best known, but PTFE-coated products are also manufactured under other trade names. As Dr. Peter Sakas states: Under normal cooking conditions, PTFE-coated cookware is stable and safe. When PTFE is heated above 530 degrees Farenheit, however, it undergoes breakdown and emits caustic (acid) fumes. Most foods cook at lower temperatures: water boils at 212 degrees, eggs fry at 350 degrees, and deep frying occurs at 410 degrees. But when empty PTFE-coated cookware is left on a burner set on the high setting, it can reach temperatures of 750 degrees or greater. Thus, if a pan is being pre-heated on a burner and forgotten, or if water boils out of a pot, breakdown of the PTFE can occur. In other words, PTFE cookware has to be "abused" to emit toxic fumes, but this is not as rare as it might seem; many people fall asleep after they put pots or pans on the stove to heat. Birds kept in areas close to the kitchen will usually die very shortly after breathing the fumes. Even birds kept in another room are at great risk. Severe breathing difficulties, such as gasping for breath, may be seen just prior to death. Humans, dogs, cats, and other mammals are somewhat less sensitive to the very serious effects of these fumes. 1. Remove the affected bird immediately from the home and supply lots of fresh air. Unfortunately, other than this, no first aid exists. 2. Call your avian veterinarian immediately. The most common insecticide poisoning in pet birds occurs when the house is sprayed ("fogged" or "bombed") for various pests. As already mentioned, birds have very sensitive respiratory systems. Always take the birds and their cages out of the house before spraying. When spraying is finished, open all doors and windows to help remove the odours. Use fans if needed. Do not bring your birds back in the home for at least twenty-four hours. Consult your veterinarian for the safest and most effective foggers. 1. Remove the bird immediately and supply lots of fresh air. 2. Provide general supportive care. 3. Call your veterinarian immediately. 4. Bring the insecticide along. Acetone, Ammonia, Antifreeze, Ant syrup or paste, Arsenic, Bathroom bowl cleaner, Bleach, Boric acid, Camphophenique, Carbon tetrachloride, Charcoal lighter, Clinitest tablets, Copper and brass cleaners, Corn and wart remover, Crayons, Deodorants, Detergents, Disinfectants, Drain cleaners, Epoxy glue, Fabric softeners, Garbage toxins, Garden sprays, Gasoline, Gun cleaner, Gunpowder, Hair dyes, Herbicides, Hexachlorophene (in some soaps), Indelible markers, Insecticides, Iodine, Kerosene, Lighter fluid, Linoleum (contains lead salts), Matches, Model glue, Mothballs, Muriatic acid, Mushrooms (some varieties, Nail Polish, Nail polish remove, Oven cleaner, Paint, Paint remover, Paint thinner, Perfume, Permanent wave solutions, Pesticides, Photographic solutions, Pine oil Plants, Prescription and non-prescription drugs, Red squill, Rodenticides, Rubbing alcohol, Shaving lotion, Silver polish, Snail bait, Spot remover, Spray starch, Strychnine, Sulphuric acid, Suntan lotion, Super glue, Turpentine, Weed killers, Window cleaners. Acids, Alkalis, Petroleum Products, Dishwasher detergent, Drain cleaner, Floor polish, Furniture polish, Gasoline, Kerosene, Paint remover, Paint thinner, Shoe polish, Toilet bowl cleaner, Wax (floor or furniture), Wood preservative. Source: Adapted from American Medical Association Handbook of Poisonous and Injurious Plants (Chicago: American Medical Association, 1985); R. Dean Axelson, Caring For Your Pet Bird (Poole-Dorset, England: Blanford Press, 1984) Gary Gallerstein, Bird Owner's Home Health and Care Handbook (New York: Howell Book House, 1984); Greg J. Harrison and Linda R. Harrison, eds., Clinical Avian Medicine and Surgery (Philadelphia: W.B. Saunders, 1986) and John M. Kingsbury, Poisonous Plants of the United States and Canada (Englewood Cliffs, N.J.:Prentice-Hall, 1964).Alicia McWatters, Ph.D., C.N.C.